Complete with Stainless Steel Mounting Hardware. For Firestik Antennas Up to 5'. 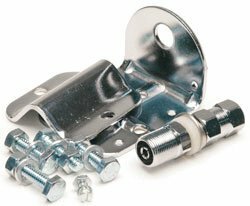 Chrome Plated 3-Way Antenna Mirror Mounting Bracket with K-4A Stud. Chrome Plated Steel Bracket and Clamp. Includes Screw-On K-4A Antenna Stud. Designed to Mount Antennas Horizontal or Vertical. Can be Mounted without Clamp on any Flat Vertical Surface. If you have any questions about this product by FireStik, contact us by completing and submitting the form below. If you are looking for a specif part number, please include it with your message.